Today is National DNA Day, a day designated to promote genetics and genomics education. I’ve always found it a little unfortunate that DNA day falls so close to Earth Day (April 22). Clearly the latter is more recognized and celebrated throughout the world. Wouldn’t we do better to celebrate DNA Day six months from now, when it might get a little more attention? But in considering it further, I think we can benefit from the opportunity to celebrate DNA and our planet at the same time. If nothing else, it provides a perfect opportunity to tackle one of the biggest challenges we face in genomics education: Genetic Determinism. ‘Genetic determinism’ or the prevailing perception that our genes determine health and dictate our behaviour, is a misconception that healthcare providers and the genetics community tackle daily. In reality, we know that genes are only one piece of the puzzle. Our genes plus our environment and the complex interaction between the two must be considered in order gain a realistic understanding of health and disease risk. So, what would the average person reading this article (or just the headline) likely take away from it? Probably: genes don’t matter. Geneticists don’t dispute the idea that genes aren’t the only factor that determines whether we get sick; many of them agree with that point. The problem, geneticists say, is not that the study… arrived at a false conclusion, but that it arrived at an old, familiar one via questionable methods and is now being portrayed by the media as a new discovery that undermines the value of genetics. So, essentially just because your genes aren’t everything, doesn’t mean your genes are nothing. …scientists pass the buck when it comes to communicating science. We write the papers, but then hand them off to journalists and say “here, explain this to everyone else.” … Then, we gripe and moan when the science is shottily explained or, worse, completely misinterpreted. This argument can be extended beyond researchers to healthcare providers, and the genetics community in particular. For genetic counsellors specifically, our business is communication. Which brings us back to DNA Day: this day is not only an important initiative, but a yearly reminder that we could all be doing a little (or a lot) more. This blog post was originally published on www.theGenoScape.com. I often liken the human genome to a savings bond. When we get it, we overpay. Eventually– barring an economic meltdown (or genomic bubble)—it matures. For most of us the return on investment will be low. But for a few of us, the return on investment will be substantial. Most people who have met with a financial advisor have probably used some sort of Risk Tolerance Calculator at some point in time. These calculation tools are meant to help give you and the advisor an accurate sense of the types of investments and portfolios that are likely to be right for you. My husband and I went through this exercise again recently and it was interesting for me to see how different our risk tolerances are. I started thinking that this type of risk tolerance tool could be applied in a genetic counselling context, especially with respect to whole genome sequencing. “You know it’s there, but you don’t know what it means,” [Milunksy] said. “You’re smack in the territory of inviting anxiety into your life. And this may have no meaning whatsoever in your entire life.” I disagreed. The results had actually taken some uncertainty out of my life, I told Milunsky… I have a rare mutation linked to rare conditions, most cases of which can be treated. Wouldn’t it make sense for me to undergo a blood test regularly to see whether my blood counts had changed? In my role at Medcan, I counsel healthy people who are undergoing SNP-based genomic testing for preventative health reasons. Our current testing panel is centered on: 1) common diseases 2) SNPs that have the highest level of validation and 3) health conditions where ‘actionable’ preventative recommendations can be given. Clients have the option to opt-out of receiving certain results (for late-onset Alzheimer’s disease, for example), although anecdotally very few patients actively opt-out of receiving information. Conversely, clients routinely ask about the possibility to know ‘everything.’ These individuals aren’t concerned that there is no preventative recommendations related to particular health condition, they are just interested and curious to access as much info as they can. Just like John Lauerman, these are the type of people who would participate in the Personal Genome Project, if it were available to them in Canada. 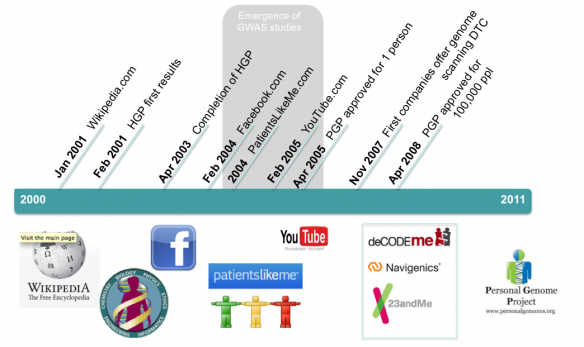 Whole genome sequencing (WGS) presents a new challenge for the field of genetic counselling. It is impossible for genetic counsellors not to think about how different our role will be in the context of clinical results of an entire genome. In my opinion, it is not necessarily the ambiguity of the results that poses the biggest challenge (most of us already deal with ambiguous results on a daily basis), but rather the sheer volume of data that seems insurmountable. Most genetic counsellors will spend about 30-45 minutes with a client discussing genetic testing for a single gene. Using our current model, it seems incomprehensible to review results of a whole genome sequence. To date, this issue has mostly been discussed in the context of returning WGS results to research participants. In his 2011 article in Personalized Medicine, Misha Angrist argues that the ‘feasibility issue’ shouldn’t be used as a reason not to return research results. Similarly, I agree that lack of feasibility should not be a reason to keep WGS out of the clinic. There are new models of care and new technological tools that can be developed to address the feasibility issue. So, how do you manage to provide comprehensive genetic counselling in the context of piles and piles of data? I think the key is to find a way to distinguish between what people can know and what people want to know. The obvious idea (and similar to what we currently use at Medcan in counselling about the SNP-based genome testing) would be to create a comprehensive checklist of health conditions that people would like to opt-out of receiving. For understandable reasons this would be overly cumbersome and incredibly time consuming. There are various ways to design this type of tool and personalized report. But a built-in mechanism to provide updated reports to reflect changes in categories or changes in patient decision-making (which may shift based on age, circumstance, health status) would be important. As far as I know, I don’t think this sort of tool is being used currently, although I’d love to hear from genetic counsellors working in WGS research settings or in those clinics that are offering whole exome sequencing for complex cases. I do think this type of tool should be trialed in a research context, so when it comes time for clinical applications we are prepared to deal with the deluge of data. While there are clearly differences between the financial application of a Risk Tolerance tool and one that is applied to health, disease prevention and diagnostics, I think this is an important concept to consider. The same justification that can be used to argue against a one-size-fits-all approach to medicine can be used when it comes to whole genome sequencing. As patients increasingly become more involved in their healthcare, it is important that we are armed with the tools to enable individuals to decide the type of information that they want to know. We suspect that many genetic counselors out there got hooked on genetics by an intriguing bit of information, something that grabbed your attention and made you say “Hey, that’s pretty cool. I want to learn more about this field.” Sure we all want to help people and be good counselors, but the intellectual stimulation of the complex field of genetics also plays a critical role in keeping the spark in your career relationship. 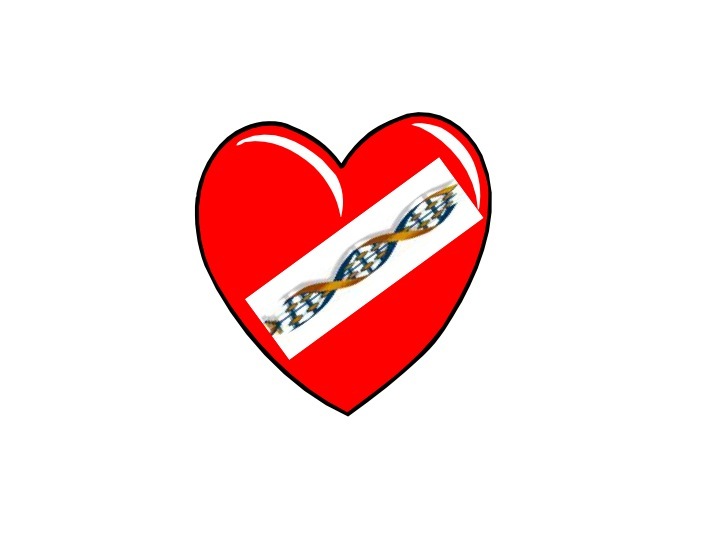 So, in a slightly belated Valentine’s Day posting, we wonks and nerds here at the DNA Exchange (well, there is no “here” here, just 5 of us who email back and forth on an irregular basis) decided to provide some Genetic Factoids that caught our fancy. They include the profound, the moving, the questionable, the near sensationalist, and some gee whiz stuff. Be stimulated by them, have fun with them, and in the Comments section, share your fave facts about genetics with our readers. ♥ Elizabeth Taylor’s thick eyelashes were the result of a mutation in FOXC2, which can cause lymphedema-distichiasis syndrome (though she did not appear to have “photo”-phobia). (Elizabeth by J. Randy Taraborrelli, Grand Central Publishing, 2006). ♥ Because of a mutation and in-breeding, the town of Sao Pedro, Brazil has a 10% rate of twinning. Most of the twins have blue eyes and blond hair, which had raised suspicions that the unusual number of twins was the legacy of some peculiar science experiment by German ex-pat in hiding Josef Mengele (Nazi ‘Angel of Death’ Not Responsible for Town of Twins, New Scientist, January 27, 2009). ♥ Levels of gene expression for genes involved in fighting infection are lower in people who are lonely, according to researcher Stephen Cole (Ah, yes, but the lonely suffer less from heartache). (Cole S. et al., Social regulation of gene expression in human leukocytes. Genome Biology, 2007, 8:R189). ♥ In a study by Muscarella and Cunningham, males and females viewed 6 male models with different levels of facial hair (beard and mustache or none) and cranial hair (full head of hair, receding and bald). Participants rated each combination on 32 adjectives related to social perceptions. Males with facial hair and those with bald or receding hair were rated as being older than those who were clean-shaven or had a full head of hair. Beards and a full head of hair were seen as being more aggressive and less socially mature, and baldness was associated with more social maturity.Of course, social maturity is very difficult to measure in men. (From: http://en.wikipedia.org/wiki/Baldness; Muscarella, F. & Cunningham, MR. The evolutionary significance and social perception of male pattern baldness and facial hair. Ethology and Sociobiology, 1996, 17 (2): 99–117. doi:10.1016/0162-3095(95)00130-1). ♥ If you were to recite the ATCG sequence in your own DNA (which is 3 billion bases pairs long) and uttered 100 ATCG sequences per minute without taking a break for sleeping, eating, or drinking, you would speak for 57 long years. Not so helpful for maintaining close relationships. ♥ A report in Scientific American in late 2011 looked at the websites that were most commonly linked to by science-lovers on Twitter. There are several flaws inherent in the “study design,” but regardless it is interesting to note that Genetics and Astronomy were very closely linked: meaning people who linked to Astronomy articles & content were more likely to also link to Genetics content and visa versa (Hey there Genetic Counselor, you with the stars in your eyes). Other interesting correlations included Physics and Fashion as well as the fact that Chemistry appeared to be an outlier, not being linked to any other science. ♥ And, of course, let us never forget The Jumping Frenchmen of Maine. In my honest (and perhaps wishful) opinion, I hope we never gain the ability to do so. I was reminded of that interview when The Globe and Mail ran a front-page story at the beginning of January: ‘Unnatural selection: Is evolving reproductive technology ushering in a new age of eugenics?‘ It is a piece that we have all read a dozen times before, with quotes from GATTACA to boot. As I started in on the article though, I had a brief moment of self-doubt. More specifically, I wondered if my own ‘wishful thinking’ (point number 2, above) might cloud my judgement and ability to see what is actually being offered in the real world. What if someone is offering testing in the realm of ‘designer babies’ that I am not aware of? In the end, contrary to what the title suggests, the article mostly focused on Mendelian diseases and the well-known ethical ‘slippery slope’ discussion. It was also chock full of quotes from medical professionals who bluntly state that we don’t have the capability to select for cosmetic traits, and will likely never have the ability to accurately do so. There were still things in the article that surprised me, though. For one, the openness of PGD gender selection testing being routinely offered by a US-based center for non-medical indications. I also learned about a fertility center called Natera, that has considered using PGD to test for common complex disease, such as psoriasis. (In looking into the company further I was happy to see that they have a number of genetic counselors on staff.) Most notably, I was surprised by quotes from a number of fertility specialists who say they routinely get questions about whether they can select for specific cosmetic traits. As genetic counselors, we will spend the rest of our professional lives explaining that our role does not involve the creation of ‘designer babies.’ This is a professional hazard that we have no choice but to accept. As frustrating as this perpetual conversation may be, at least right now we have the science to fall back on: We can‘t do that. We don‘t do that. But, what if? What if the science gets there, and the myth of the ‘designer baby’ becomes a reality? I’m pretty confident that we will not see a day when parents routinely use reproductive technologies to select for cosmetic traits, or even against multifactorial diseases. The complexity of the genome is too great, and the gene-gene, gene-environment, epigenetic interactions too numerous and minute to control. But, maybe I’m just blinded by my personal opinions on the matter. I’d love to hear what others think. Cast your vote and/or share your thoughts below. *Cosmetic traits being used to describe polygenic phenotypic traits, such as height, eye color, hair color etc. This week (November 20-26) genetic counsellors across Canada will be participating in the 2nd annual Genetic Counselling Awareness Week (see my post on this topic last year.) The theme for this year’s event is centered around dispelling common myths about genetics. For a 2nd year in a row I am serving as a co-chair for this initiative, and for the second year in a row I am blown away by the amount of work and thought that GCs have put in to ensuring this week is a success. Even seemingly simple events, such as organizing a trivia night or movie screening, require an incredible amount of planning and coordination. GCs in Canada are taking time out of their busy lives and are volunteering their time and expertise. Genetic Counsellors in Edmonton, Alberta and Winnipeg, Manitoba will be featured on local news programs. Groups in St. John’s, Newfoundland and Ottawa, Ontario will each be hosting a trivia night at a local pub. The GCs in Winnipeg are hosting a similarly themed evening, using clips from popular television shows, to help dispel common myths about genetics. Multiple movie screenings will be occurring across the country. Films being screened this year include: In the Family, Extraordinary Measures, GATTACA and At My Mother’s Breast. In most cases, a genetic counsellor panel discussion will follow. Several centres will be setting up information booths within their institution, in order to liaise directly with patients and hospital staff. Rumor has it an Alberta-based group will be putting together a fun-loving You Tube video this year. Click here for last year’s video from GCs at North York General Hospital. For a full list of events and info, visit the GC Awareness Week website. Want to help spread the word? Pass along any relevant info to family members and friends who live in Canada, or use the designated hashtags #GCAwarenessWeek #geneticcounselling and #CAGC when tweeting about GCAW or GC-related issues throughout the week. Can we learn from a public course on our own field? Realizing the benefits of genomics will require an educated public who can understand the implications of genomics for their healthcare and evaluate the relevant public policy issues… The development of effective education and training efforts will require that diverse communities be engaged, so that all can appropriately benefit. I love learning about unique ways that the public can engage in discussion about genetics and genetic counseling issues. So naturally I was eager to learn more about the design of the DNA Ethical Dilemmas course that will be starting tomorrow (Thursday, Septemer 29) through the New York Times Knowledge Network. The 5-week course, taught by Pulitzer Prize winner Amy Harmon, covers a wide range of topics and seems tailor-made for anyone interested in a career in genetic counseling. I would have jumped on this opportunity had it been available when I was considering genetic counseling as a career. But who else signs up for this type of course? And how are the topics/curriculum chosen? I was able to get a bit more info, which might be of interest those of you with similar questions. The topics are pulled primarily from Amy Harmon’s articles and work over the years. These range from: the ethics of PGD, living with a genetic lethal disorder, direct-to-consumer genetic testing and how to (or how not to) share your genetic results with your family members. There is also a subset of the course titled ‘toward a better informed public’ with case studies using the experiences of the Havasupai Indians and Texas parents. In reading through the material, I was struck by how most (if not all) of these topics are ones that are commonly included in a Masters-level genetic counseling curriculum. As you may know, NSGC president Karin Dent will be helping out with the opening session. I also learned that Daniel Vorhaus, a lawyer who writes extensively about legal aspects of genomics, will be guest lecturing for one of the sessions as well. As you might expect, the ‘students’ last year were made up of a large number of clinical and academic people, including doctors, biology graduate students and professors. But there were also others from the the non-academic world, which included those who were struggling with some of these issues themselves or within their families. It would be interesting to know how many of this subset have had formal genetic counseling previously, or sought it out after completing the course. If you have taken this course, or are planning to take it this time around, I’d love to hear your thoughts on this type of model. What can the genetic counseling community learn from these sorts of public genetics education initiatives? How can we embrace creativity to make what we do more accessible? Could and/or should we be doing more to help engage the public about genetics/genomics? For inspiration, I recently came across this video: A Brief Introduction to Genetics (below). I think it’s a great example of how genetics education can be made more accessible and digestible for the general public. If anyone has any ideas about new and unique ways for public engagement, please share here or send me a note (alliejanson[at]gmail.com).